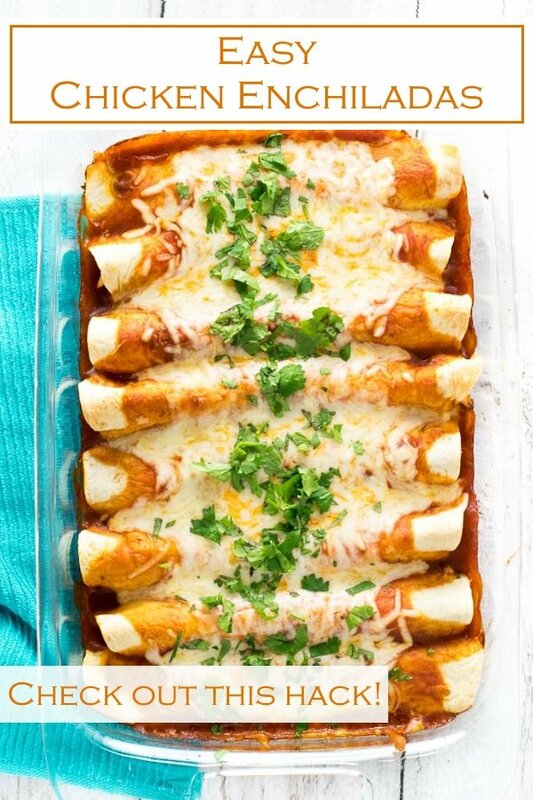 These Easy Chicken Enchiladas are as stupidly simple to make as they are flavorful! Each bite bursts with tender chicken, gooey cheese, and big enchilada flavor! Do you ever feel excessively proud of yourself for discovering something exceedingly simple? It is probably how Columbus felt, sailing lost on the ocean for months before stumbling on an un-bypassable landmass. Good job navigator. Well, that is how I felt when I discovered the absolute gloriousness of using rotisserie chicken in my already easy chicken enchiladas recipe. Rotisserie chickens are easy family dinner’s by themselves, but they are also exceptional kitchen hacks too. Not only is the chicken all ready to cook and ready to use in a myriad of dishes, the manner in which the chicken is roasted yields mouth-wateringly tender meat. Likely, more tender than if you cooked it yourself. 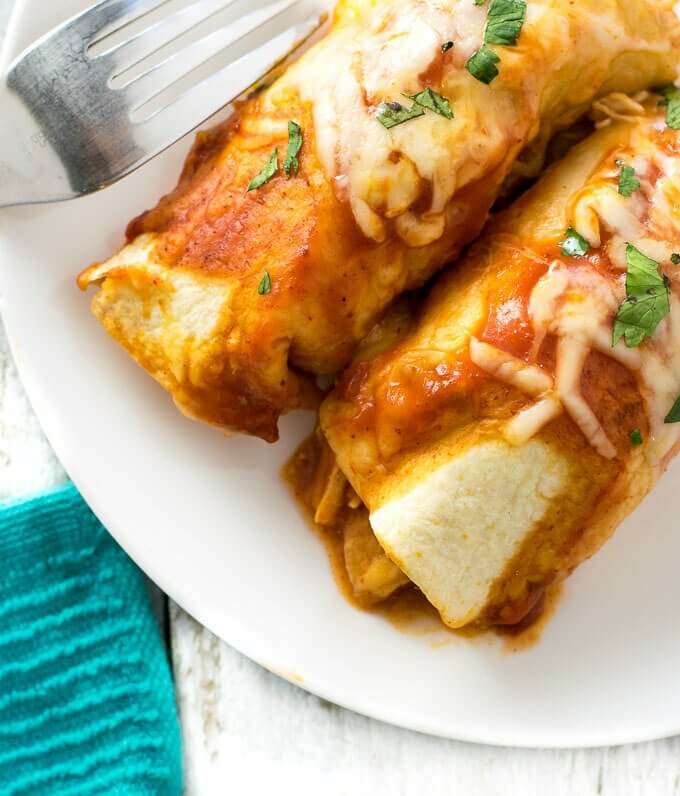 So to sum it up, this easy chicken enchiladas recipe requires less work and it will give you more flavorful results than more labor-intensive recipes. This is the same hack I use for my classic chicken salad recipe too. The chicken is combined with chopped green chiles for a mild kick, fresh diced onions to add texture, and bathed in red sauce. The cheese mixed in with the shredded chicken really helps enhance the tender mouthfeel of each bite. This is a one pan recipe, so don’t expect to do a lot of dishes. You simply need a 9 inch x 13 Inch baking dish (affiliate link). Large flour tortillas will fit in the dish perfectly. I suspect you already have one in your kitchen for making cakes or lasagna. Chicken Enchiladas should be cooked at 400 degrees for 25 minutes. If your oven temperature isn’t reliable, just cook it until the cheese is melted, bubbling, and beginning to brown. 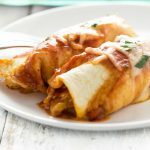 If you are craving enchiladas, there are many ways you can prepare them beyond this easy chicken enchiladas recipe. 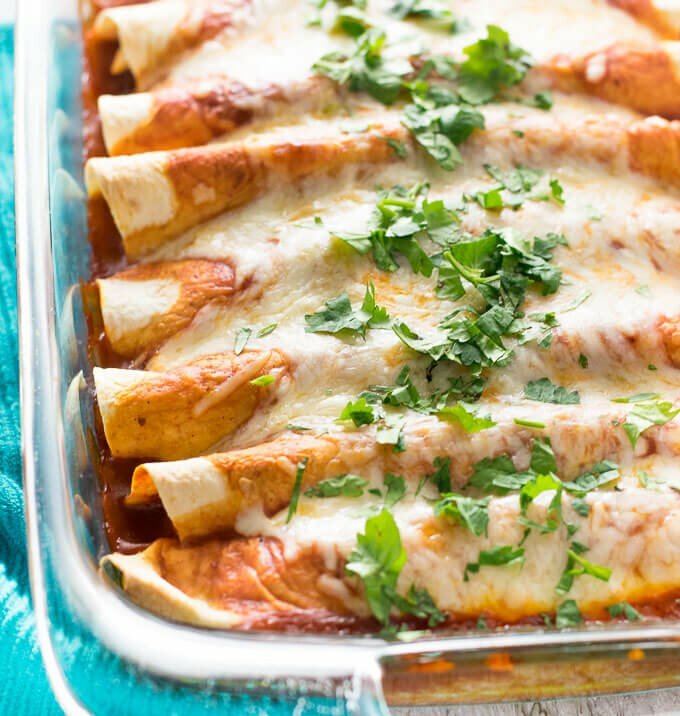 Check out these Vegetarian Enchiladas for a flavorful twist, or create a casserole with my Easy Chicken Enchiladas Casserole or Quinoa Enchiladas Casserole. Spread sauce from half of one can of enchilada sauce evenly across the bottom of a 9x13 baking dish. Pour other half of canned enchilada sauce into shredded chicken along with 1 cup of cheese, onion, and green chiles. Mix to combine. Scoop enchilada mixture into flour tortillas (~1/3 cup each) and roll the tortillas to close. Place in baking pan. Pour remaining can of enchilada sauce over the tortillas and top with remaining 1 cup of cheese. Place in oven and bake for 25 minutes, or until cheese is melted and starting to brown. IF YOU LIKED THIS RECIPE you will love my Chicken Fajita Quesadillas too! This recipe was originally published July 14, 2017 on FoxValleyFoodie.com. If you enjoyed reading my Easy Chicken Enchiladas recipe then you should probably like me on Facebook and follow me on Pinterest too. That’s what I would do at least, because if you don’t get to know me but you still use my recipe it is kind of like taking candy from a stranger, and your mom taught you not to do that. Don’t disobey your mom, subscribe to Fox Valley Foodie today. Holy cow, you were right! These are amazing! where do the diced onions come in?? Thanks for catching that. Combine them with the chicken and green chiles. 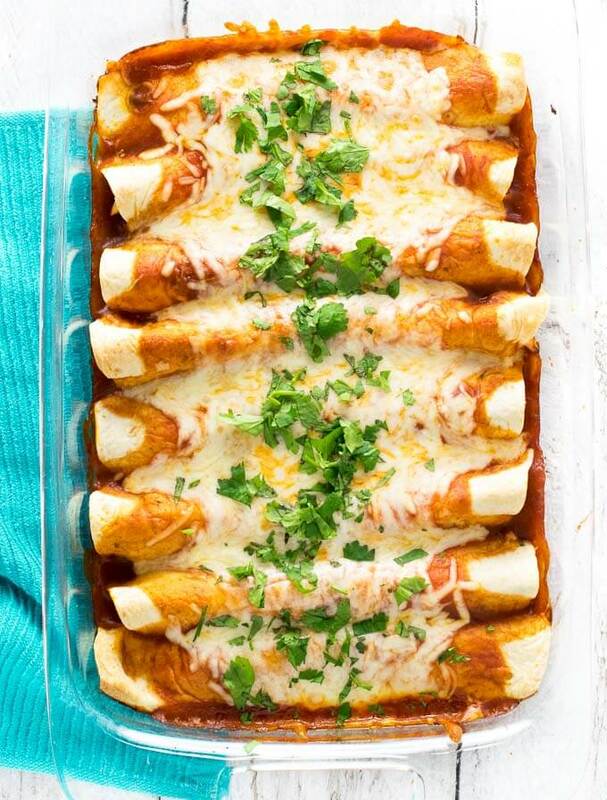 If you make a few batches of these and would like to freeze a few, would you recommend leaving off the sauce and cheese to freeze, thawing, then adding cheese and sauce and baking per regular instructions? I haven’t tested it out, but that sounds like a great idea so things don’t get too soggy.